WILLEMSTAD - The first fireworks containers have arrived on the island. 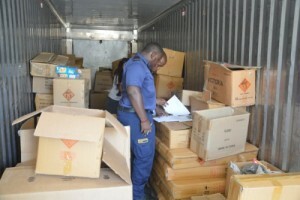 The three 40-foot containers were led by police to the warehouse in Brievengat for inspection and storage. The fire department was also present together with the Inspectorate of Economic Affairs and the Tax Accounts Office. All the fireworks are registered. The location in Brievengat was chosen after the warehouse in the Seru Loraweg exploded in 2015.